How Far is Sipani Jardin? Sipani Jardin in Chandapura, Bangalore is a perfect place where you can enjoy your time admiring the surrounding environment and have a peaceful and comfortable stay. It is located amidst lush greenery and comprises of 1BHK apartments for sale in Chandapura, Bangalore with a size range of 605 sq. ft. 2BHK compact and spacious apartments with sizes ranging from 835 - 935 sq. 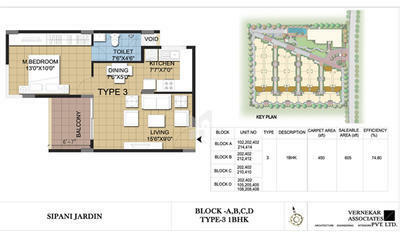 ft. and 3BHK with sizes ranging from 1285 - 1325 sq. ft. flats for sale in Bangalore. If you are a nature lover and enjoy to spend time in an environment that is calm and brings out the joy in you, Sipani Jardin is just the right place for you. It comprises of Herbs Garden, Spice Garden, and Aroma Garden. Other than this it offers you amenities such as a playschool, creche, video door phone and a gym. This project is a perfect combination of elegance and peace. This residential space is just a few miles away from the bustling IT Hub of Bangalore, Electronic City. Residents in Sipani Jardin have easy access to Electronic City and the people working there can commute conveniently every day. You can celebrate every day at Sipani Jardin and live your life to the fullest, feel relaxed and refreshed all the time. Exterior finish with weather-proof paint. Internal walls with Oil bound distemper. Lift Lobby - Ground Floor Lobby and upper floors with Vitrified flooring. Staircase - Vitrified tiles flooring. Foyer, Living &Dining, Master Bedroom &Other Bedrooms: Vitrified tiles. Floor mounted European Water Closet (EWC) in all toilets of Hindware brand. Quality wash basin of Hindware brand. CP fixtures & fittings- Jaguar brand. Provision for electrical geysers in all bathrooms. Hot & Cold mixer unit for shower and branded CP fixtures. Main Door Frame - Teakwood frame with both sides polished teak veneer shutter (with SS/ Brass hardware). Bedroom Doors - Hardwood frame, with painted flush shutter. Toilet Doors - Hardwood frame with painted waterproof flush shutter. Ventilators for all the toilets. Inlet & Outlet for washing machine/Dish washer. Stainless steel sink with single bowl & CP fittings. Provision for exhaust fan, water purifier, microwave, mixer grinder & refrigerator. Dadoing with glazed ceramic tiles up to 2 feet height above the counter. 100% power back-up by Stand-by generator for lights in common areas, lifts & water pumps. 0.5 KVA power back up for each apartment - with automatic changeover switch. Fire resistant electrical wires of Havells / HPL brand. Electrical Modular switches of Finolex brand. One Earth Leakage Circuit Breaker (ELCB) for each apartment for safety reasons. One miniature circuit break (MCB) for each apartment for lighting & power circuits. One TV point in the living room & one in the master bedroom. One AC point in the Master Bedroom. Telephone points in master bedroom and living/dining area. All apartments will be provided with 3 KVA power. 10 passenger lifts of reputed brand. Each block with automatic lifts from the basement level. Sewage Treatment Plant of reputed brand. 7 Ft height compound wall around the whole campus. 2 gates for entry and exit with security monitoring.